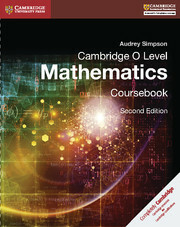 Cambridge O Level Mathematics is a resource to accompany the revised 4024 syllabus. Cambridge O Level Mathematics Coursebook provides a complete course for developing and practising the skills required for the O Level Mathematics qualification. The content has been written to offer a range of tasks that support all aspects of the Cambridge O Level Mathematics syllabus (4024) giving students the confidence to use the mathematical techniques required to solve the range of maths problems required. With detailed explanations of concepts, worked examples and exercises, this coursebook can be used as a classroom text and for self-study. Clear worked examples to allow students to approach problems step-by-step and master the required techniques. Answers to the exercises to allow students to monitor their progress. Exam-style questions at the end of each chapter for students to test themselves.